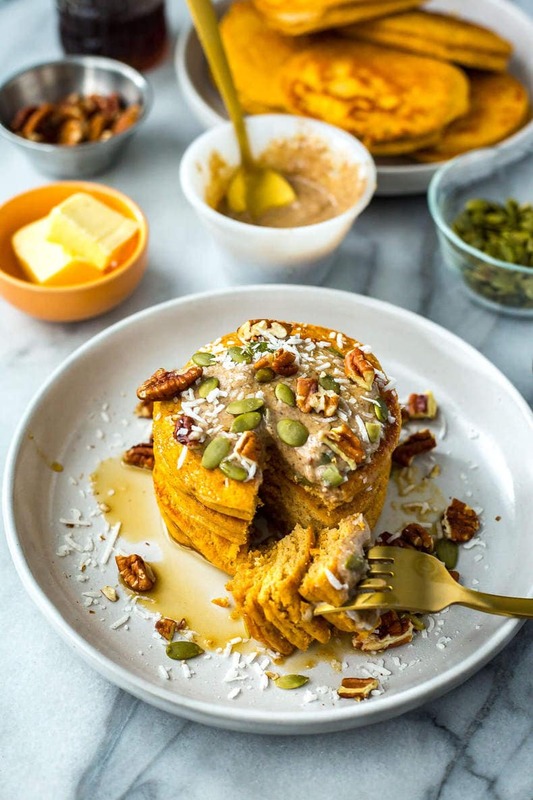 These 5-Ingredient Pumpkin Protein Pancakes are a healthy, delicious breakfast idea, and they're freezer-friendly so you can pop them in the toaster for a hot breakfast every morning! Say hello to the easiest, coziest fall breakfast EVER. Like man, have I got a pumpkin obsession these days or what?! First it was Pumpkin Spice Latte Protein Bars. Then it was Pumpkin Alfredo, which by the way was so delicious my roommate ate a good three-quarters of the recipe after I brought it home so I'm gonna take it as a true winner in my books. 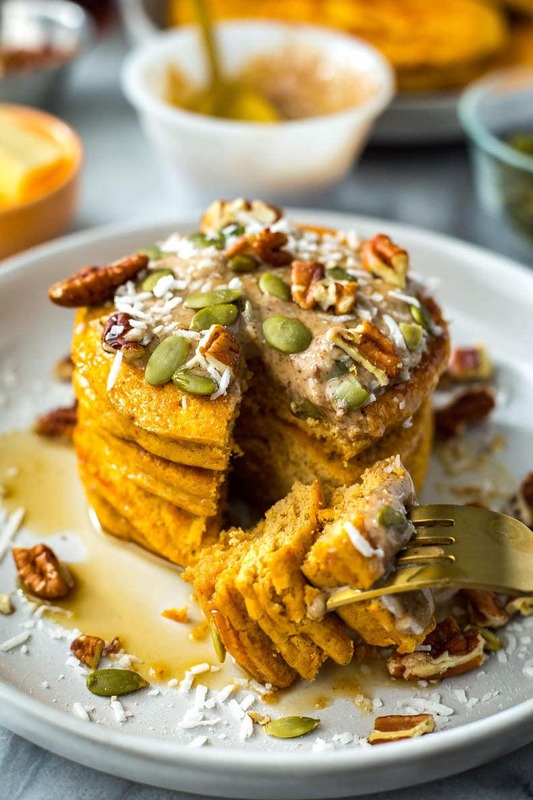 So yes, we are still going strong with all pumpkin spice everything with these 5-Ingredient Pumpkin Protein Pancakes. Please don't hate how basic I am. And of course because no pancake is ever complete without an obnoxious amount of toppings, I've loaded these up with shredded coconut, chopped pecans and pumpkin seeds then drizzled 'em with maple syrup and almond butter. 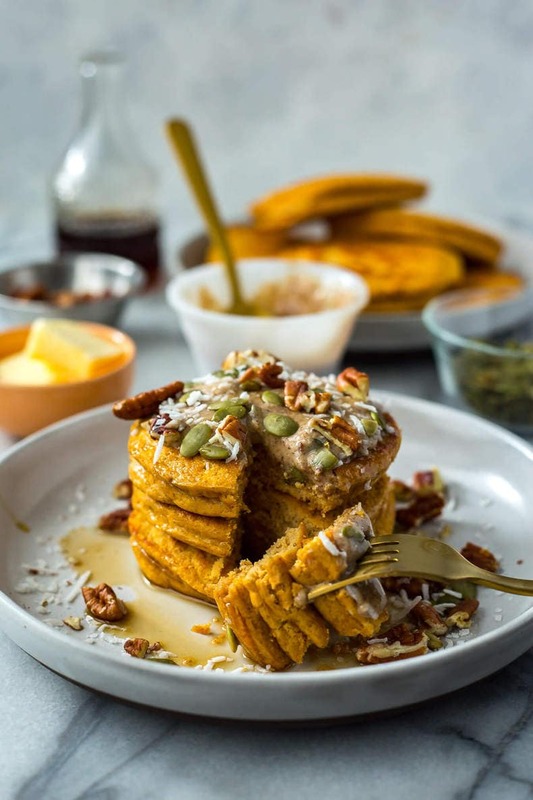 So like, the 5-Ingredient Pumpkin Protein Pancakes that you see photographed here can be considered your “weekend pancakes”. All extravagant and over-the-top, just like yours truly. But on those days you're rushing out the door and barely have time to eat, all you gotta do is pull a couple of these out of the freezer, pop in the microwave or in the toaster and you're on your way to fall heaven. I swear, just looking at these I'm taking in the aroma again. Now these are definitely a different texture from your ordinary pancake. They aren't exactly light and fluffy, and they're definitely a little more dense but the flavour is there. And for a pancake packed with 11g of protein (a serving is two btw so you're looking at a whopping 22g of protein for breakfast), you're gonna be surprised at how delicious these are. 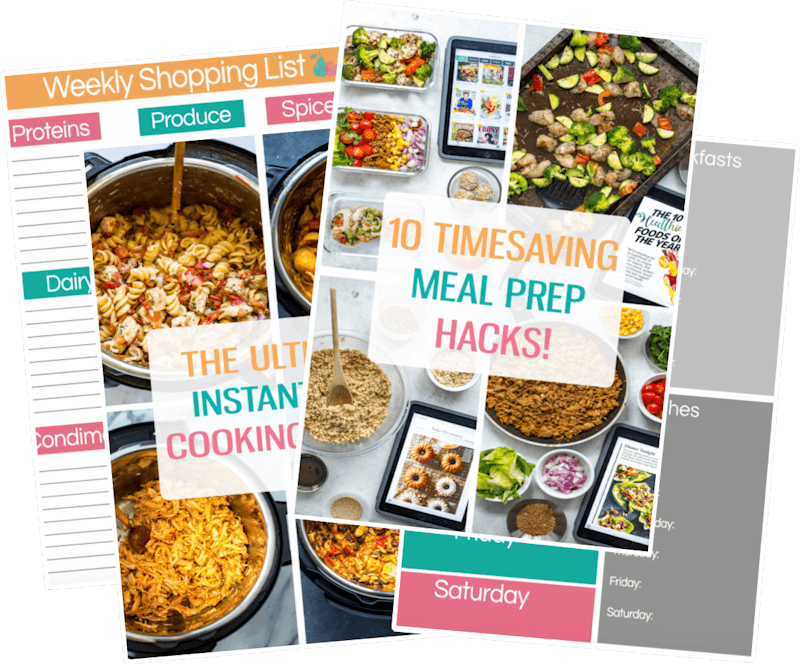 I think too, the bonus of freezer-friendly breakfasts is that everything is ready ahead of time and it gives you that much more time to get ready in the morning, or you know, relax and sleep in. As relaxing as a weekday morning can possibly be anyway. 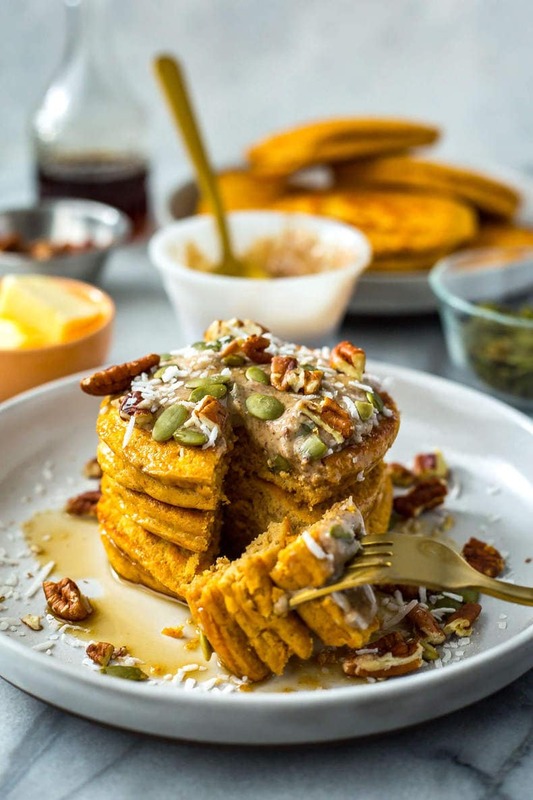 And because there are only 5 ingredients in these Pumpkin Protein Pancakes, you can rest assured that weekend meal prep will barely take any time at all. 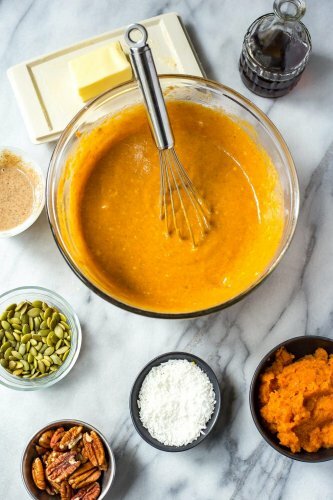 Mix together some whey protein, egg whites, pumpkin puree, pumpkin spice and baking soda – THAT'S IT! Add to a well-buttered (or oiled) pan and cook for 4-5 minutes on medium heat per side. The batter is a bit thicker so cooking these pancakes is also a bit easier than doing the traditional kind – you really won't have to worry about these pancakes spreading out and sticking together, I promise. 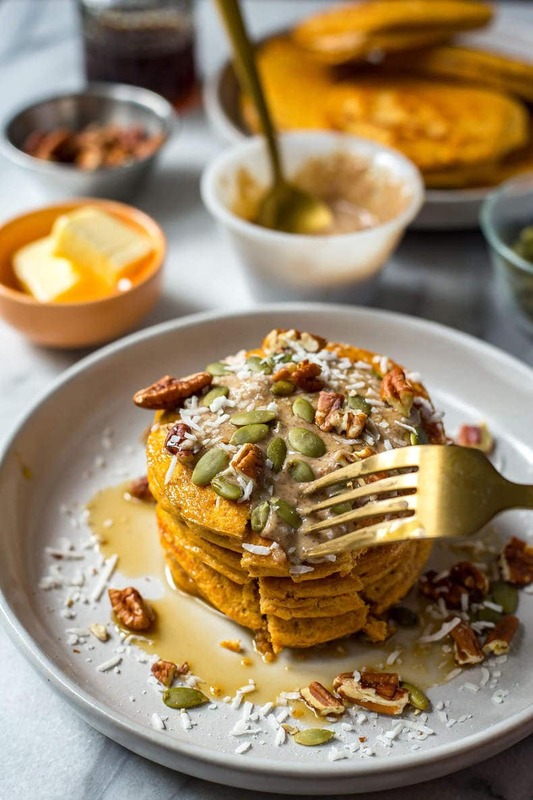 The toppings are of course optional but that's what makes these 5-Ingredient Pumpkin Protein Pancakes so fun: you can literally dress them up with whatever you happen to have on hand. My personal favourite is almond butter and it adds some more healthy fat and sweetness to them, but maple syrup is also great in a pinch. 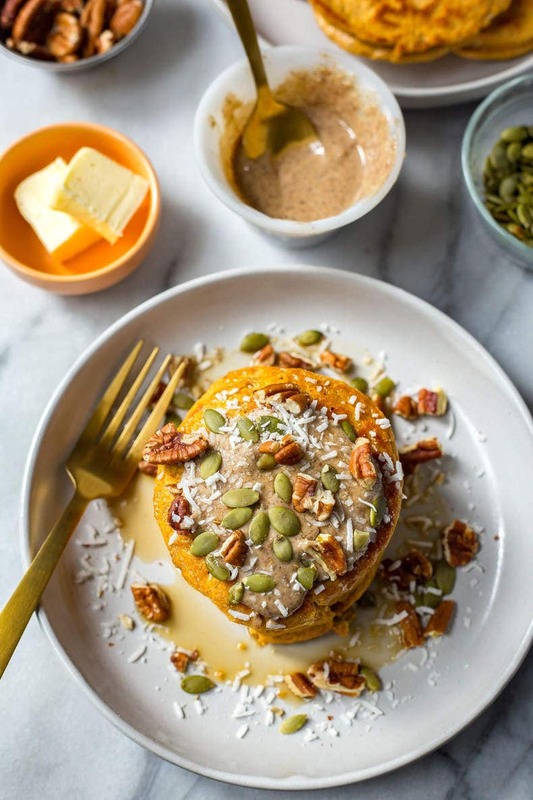 And in case you're wondering, the pumpkin puree is TOTALLY what makes these protein pancakes. And it adds extra nutrients so you don't have to worry about getting your veggies in come breakfast time. Now there's a win-win! 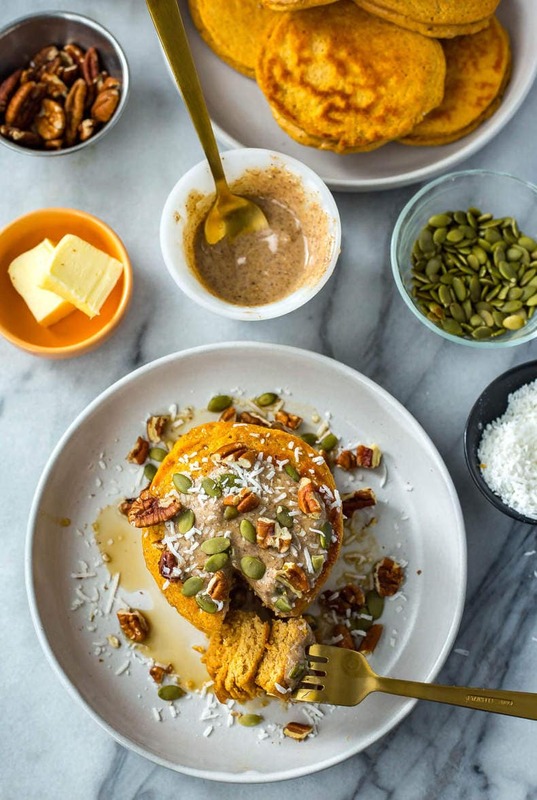 Will you be making these 5-Ingredient Pumpkin Protein Pancakes? Anytime I can have breakfast ready to go at the last minute is a good day in my books! Just freeze, reheat in the toaster and carry on with your morning! 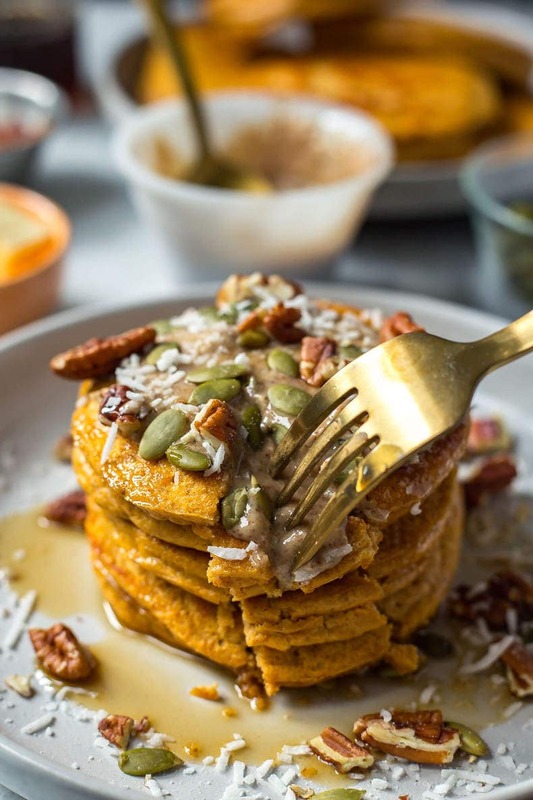 Now all I gotta do is come up with a protein pancake recipe to enjoy all year long – not that I don't love my pumpkin spice, I just don't know about it come summer LOL! 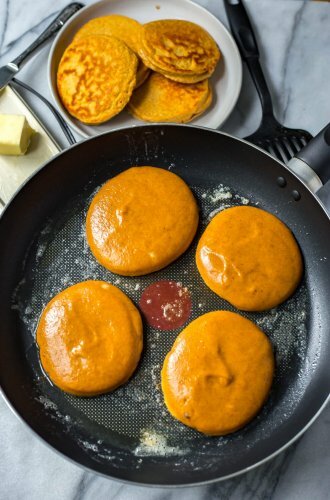 These Freezer-Friendly 5-Ingredient Pumpkin Protein Pancakes are a healthy, delicious breakfast idea. Pop them in the toaster to reheat last minute! In a large bowl, mix all ingredients for pancakes together until just combined. Heat butter in a large frying pan over medium heat. Add a small spoonful of pancake mixture to test, making sure skillet is hot enough to add pancake batter. Once bottom of tester pancake starts to form, flip and then remove from heat. Add pancake batter by large ladle scoop, cooking four pancakes at a time and flipping once a bottom starts to form, about 5 minutes. Freeze pancakes up to 2 months, reheating in microwave on high for 1 1/2 to 2 minutes or reheating in the toaster. Top with optional toppings and serve! what kind of protein Powder do you use? Whey, pea, etc? The protein powder you use really makes a big difference. I made these and LOVED them with my Lean Fit vanilla Whey protein. Everyone loved them! So I made them again at my daughters house with her Vega Protein powder – HUGE FAIL> They were over the top sweet and icky and ‘proteiny’. My granddaughter ate them and they were OK with peanut butter slathered on them, but nothing like the amazing taste of the original ones. Just a heads up if you’re planning on making them- maybe do a half batch first to see if you like the results. That is great to know, thanks for sharing Heidi! I found the taste was great with this brand I get from Costco called Kaizen Naturals… I know so many people have a go-to for protein powder for this reason, there are all kinds of tastes and textures out there! Hey! Dumb question here. Do you use 2 actual cups of protein or 2 scoops of protein powder. I just want to double check before I dive in a make these. Thank you. 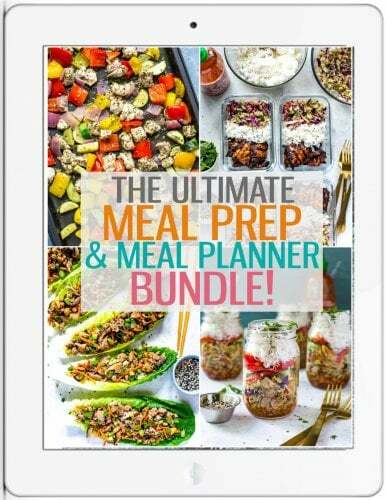 Hi Just wanted to let you know I have cooked a few of your recipes from here and I am not too sure if you have your metric calculations right. When I have made the chicken dishes they have turned out amazing your baking recipes are another story. I have wasted a kilo of protein power following your pumpkin protein bar and now the pancakes! I am not exactly sure why they have failed so MISERABLY but I have noticed that in metric measurements you have been asking for almost double the protein powder. I would love it if you could clear this up for me. Hi James – so sorry for the delay in response! I provide Imperial measurements on my website, not metric. I have a plugin that provides the metric equivalent but whenever you are translating a recipe from imperial to metric (especially when it comes to baking) you just aren’t likely to get it perfect, which can result in some recipes not turning out. Because baking is such a science and often relies on exact ratios of wet to dry ingredients, you really do need to follow a recipe exactly according to the original measurements. I have only tested these recipes using imperial measurements, and I’m very sorry you wasted ingredients as a result of trying the metric equivalent but I just unfortunately can’t test all my recipes using different measurements. I’m definitely going to consider removing the metric equivalent feature as I believe that can mislead people and cause issues as you described. Again, my apologies and I’m happy you have liked the savoury dishes so far! Do you have any suggestions on what to substitute the whey protein powder with? Sounds like a delicious recipe! Hey Caroline! You should be able to use rice or soy protein powder as well though I haven’t tried it myself *just a warning*. I don’t see why it wouldn’t work though! Hi what protein powder did you use- brand I mean- so I can achieve the same results- my plant based powder didn’t work ? Where do you get pumpkin puree and pumpkin spice ?